Since getting its funding late last year, Foursquare has been spending much of its time rapidly expanding the list of cities the service is available in. But the reality was that it couldn’t expand this way fast enough. So it should be no surprise that they’re throwing that all away. Yes, as the service has officially announced today (as CNET scooped a few days ago), you can now use Foursquare anywhere in the world. And there’s a lot more they’ve been working on as well. Of the new things, perhaps most notable is that the service is now on a wide variety of platforms. While it’s been out for the iPhone and Android for some time now, the Palm Pre finally has an app, as does BlackBerry, which will officially launch next week (5,000 people are currently testing it, including some TechCrunch staffers). 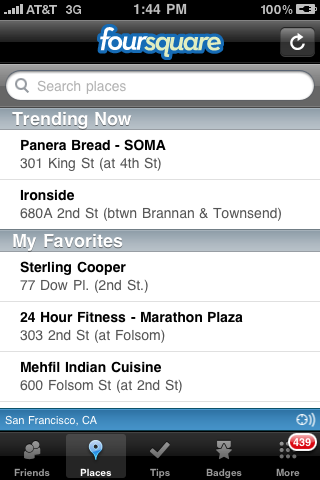 Also of note is that Foursquare is completely redesigning both its website and its iPhone app. We’ve been using an early build of the newest version of the iPhone app (1.5) for a few weeks now, and it definitely looks nicer and seems to run more smoothly. This latest version, which should hit the App Store soon, will officially remove the city-based restrictions and improved the location-finding abilities of the app. Alongside the move to a global game, Foursquare is expanding its badging capabilities. Badges are graphical items users earn for doing certain things in certain places. For example, if you check in at a gym a certain amount of times in a set period of time, you get a “Gym Rat” badge. While other gaming elements of Foursquare, such as the point system, seem to lose their luster over time, the badges remain something that users long for. And with some backend changes to the service, Foursquare finally hopes to be able to add more badges quickly (you can suggest new ones here). With the move away from cities, you’ll no longer have duplicate badges for various things, such as “Newbie,” the first time you check-in to a city, but instead these will all be consolidated. That said, there will still be badges that you can only get in certain cities. The aforementioned point system is also getting tweaked. Again, because of the move away from the idea of “cities,” Foursquare will now have a point leaderboard that is based around proximity rather than an entire city. For example, you may see that you’re among the point leaders in a 25 mile radius. And Foursquare hints that the entire point system is going to be overhauled at some point in the near future to make the game more interesting, and to curb cheating. Another big change to the service is that you will no longer be required to use an address to create a new venue. This was the biggest barrier to entry in doing so, and Foursquare is making it option by tagging the place you are creating with your GPS coordinates. This is a bit risky since there will likely be a flood of fake or wrong venues now, but it’s obviously important for the global expansion. This method is similar to what rival Gowalla does when users add new venues. The problem with GPS tagging is that it doesn’t work well indoors, but the services are slowly getting better at using other means (WiFi triangulation) to get the location data too.